This is a right-handed Sperm Whale's with an very graceful full and long curve. It is exquisitely etched 360 degrees all around. It tells the story of the hazards of Arctic Bowhead whaling. A bluff-bowed whaling ship sails amidst an iceberg-strewn sea while one of its whaleboats fastens to a Bowhead. Bowhead surface all around. A yellow banner sets the etching off from the bottom of the tooth. Directly above the banner, and etched 360 degrees around is a frame of ice outcrops. The convex side shows the whale ship with the shoreline in the distance under a setting yellow/orange sun. The concave side continues the shoreline, ice croppings, and reddening clouds, and shows a bowhead rising after being harpooned, with the small whaleboat dangerously rising on the resulting swells. The tooth is done in the scratch technique in full color, with green arctic seas, blue-white icebergs and brown hulls. The coast is done in shades of grey and tan. [Click on the picture for a larger view. 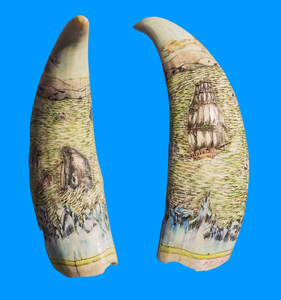 ]This classic Whale's Tooth is 7 1/4 inches along along its fantastic curve, and stands a full 6 inches tall. Its base is 1 3/4 inches wide. It weighs 206.5 grams. This tooth is, of course, legally sold - It is registered with the U.S. Department of Commerce as #21-228-0006. A handmade Sterling Silver base, made especially for this tooth, can be yours as an additional option, or choose the option of a wooden spindle base. This splendid tooth would be a great treat for any collector!